Trimmings and accessories inspection is a critical matter in apparel manufacturing industry. To achieve desired quality apparel or clothing, proper trimmings and accessories inspection process have to follow. It should be noted here that, the total process of trims and accessories inspection should be done by experienced quality inspector. 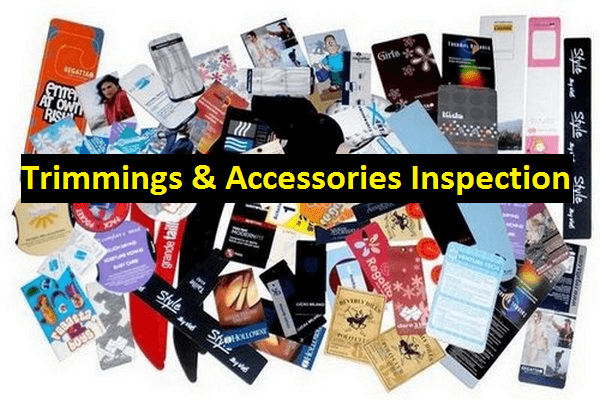 This article has presented the proper method of trims and accessories inspection with the inspection defect check list for clothing accessories and trimmings. How to Check Trims and Accessories in Clothing or Apparel Industry? All the trimmings and accessories inspection should be done on arrival into the apparel manufacturing factory by lot or shipment. Some buyer use an acceptable quality level (AQL) of 2.5 to inspect a lot or shipment, but we follow the best method is for to check each lot or shipment a minimum of 10%. That means, if 10 cartons arrive, then 10% will be checked from each of the 10 carton e.g. if only 1 size article is found in a carton then 10% of each of the 10 cartons will be inspected. If more than 1 size is found in each carton then 10% of each size of article found in each of the 10 carton will be checked. Just checking 1 carton (100%) out of the 10 carton (10%) doesn’t mean that the balance quantity of pieces in the other 9 cartons is correct. Some special cases QI will be checked 100%. In this way, trimmings and accessories inspection should be done in readymade garment or apparel sector. The following defects or faults are top most critical defects with “ZERO TOLERANCE” which must be followed in trimmings and accessories inspection process. The below matters should strictly follow during trims and accessories inspection. Do you guys have the pass/fail inspection criteria for lacing accessories like Twill Tape, Elastic, Drawcord, etc? I don’t think we can apply AQL standard for these kind of accessories.